I have partnered with Apartment Guide to serve as an Official Apartment Guide Pet Blogger! As an official blogger, I will be sharing articles filled with tips for living on a budget. This month, we're focusing our “How-To Guide for Living on a Budget” program on DIY projects and how-to tips. Every cat owner knows you can buy your kitty the most expensive, beautiful cat bed in the world, but at the end of the day, there's nothing like a good old fashioned cardboard box. 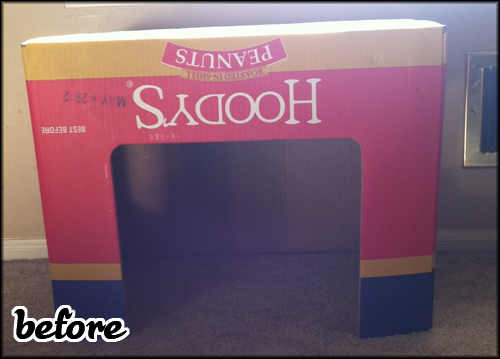 The cardboard box DIY remodel is the least expensive, low-risk craft of all because no matter what, you know your cats will love it. Every time we go to Costco, Charlie and Priscilla get a gift back in the form of a brand new box, that we pick up for free. Their most recent acquisition was a box for Hoody's Peanuts, purrfectly constructed to have a comfy napping spot on top, and a cozy cave underneath. Before: The Hoody's Peanut Box. Functional, but not exactly the pinnacle of modern cat style. After: With the help of some scrapbook paper and glue (not to mention my own blood, sweat, and tears) - The House that Catsparella built is complete! I started by covering the exterior of the box with patterned paper, before adding little details like the feline fence post (inspired by this), shuttered windows, and flower boxes. The roof is made out of an extra piece of cardboard I had laying around that I decorated with paper shingles (it's taped to the top of the box with the help of a flap), and I topped if all off with a cozy fleece mat for an extra dash of comfort and style. The entire project cost me less than $3, and that's only because I insisted on using fancy scrapbook paper. The possibilities for taking your cat's favorite box and elevating it from brown cardboard bleak to cat house chic are practically endless. The basic instructions are: Find whatever you have laying around the house (paper, markers, glue, etc. ), and get going! If you're looking for more inspiration, three of my favorite projects I've come across are the DIY Cat Rocket Ship from Apartment Therapy, the Cardboard Cat Tank from Instructables, and the Cardboard Cat Playhouse from Martha Stewart. Of course, Pinterest is always your friend when it comes to design ideas, and Petfinder has a great board dedicated to DIY kitty projects to further help you along. 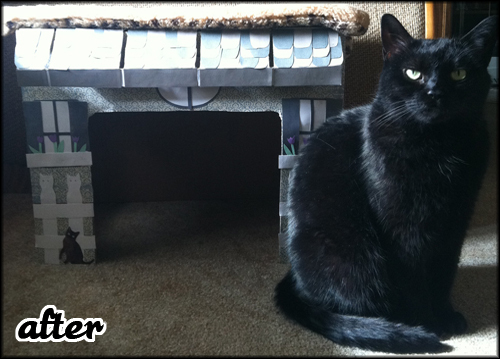 Do you have any favorite do it yourself projects you've put together for your cats? Whether you're living, looking or moving, Apartment Guide offers how-to tips for making the most of a space for you and your pet on a budget on http://www.movingtoday.com and http://www.apartmentguide.com/blog. Like Apartment Guide on Facebook at facebook.com/ApartmentGuide, follow them on Twitter @AptGuide, and "circle" them on Google+ for real-time tips and updates on making the most of your space and living on a budget. Do you prefer a cozy night in or a night out on the town? No matter your preference, enter Apartment Guide's Night In or Night Out Sweepstakes for a chance to win your perfect evening. Enter today to win! Visit www.Facebook.com/ApartmentGuide to submit your entry. 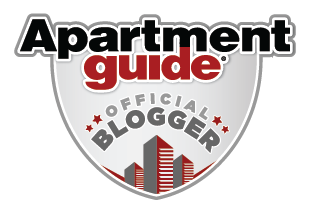 Disclosure: Apartment Guide and owner Consumer Source, Inc. have partnered with bloggers like me as Official Apartment Guide Bloggers. As part of this program, I have received compensation. They have not told me what to purchase or what to say about the products used, and believe that consumers and bloggers are free to form their own opinions and share them in their own words. Consumer Source’s policies align with WOMMA Ethics Code, FTC guidelines and social media engagement recommendations. Ugh, thanks for the guilties! I've a big box that started off life in the kitchen as a cat toy, and turned into the box that the dog toys live in...it's a big ugly box and should be prettified! I lined some cardboard boxes with coolers from Omaha steaks and put purr pads in them for my outside strays. Your little cat box is adorable. His face may not say it but I'm pretty sure he appreciates the new pad. They really prefer the roof don't they.